A few months ago we spent the day relaxing by the pool at one of our favorite resorts in Orlando. We have been making little week-end trips here for years. This time, the hotel had made some changes. One of the “improvements” was the addition of flags to the backs of all the lounge chairs. Should you be gripped with a hankering for a burger or a mojito, you just raise your flag and BINGO, a waiter appears. 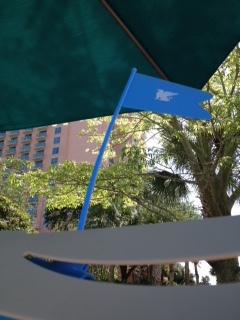 At first, I was excited about my little blue flag, but by the end of the day, I realized that its addition had changed the entire relationship between guests and the people running food & beverage service at the pool. In the past, the waiters would stop by a lot more frequently just to check in, see how you were doing and make small talk. By the end of the day, we knew each others names, where we were from..etc. With the flags, the only time you interacted was when you needed something..it was quick and impersonal, a business transaction. Ugh, just thinking about it makes me cringe. The Lord was so patient with me as I grew in my faith. Don’t get me wrong, God wants to hear our needs and requests, but like a loving father, what he wants more than anything is a deep, meaningful, transforming, life saving, personal relationship with each one of us; no flags needed.